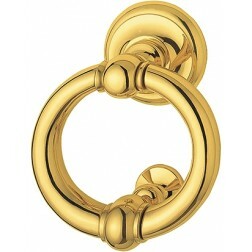 Interior door handle Hoppe Wien series on round rose. Wonderful door handle Wien series manufactured by renowned German company Hoppe. Undulating and sinuous design forged from pure brass. Roses and escutcheons are grooved at the edges with a thin hand grip. Available only in polished brass and also available in antique finishes. Wien series it will be easily mounted on your house doors using a quick-fit connection developed by Hoppe. You'll save time and above all, you will not need technical or sophisticated tools, but only a screwdriver. Shipped in the original packaging Hoppe, with mounting accessories.